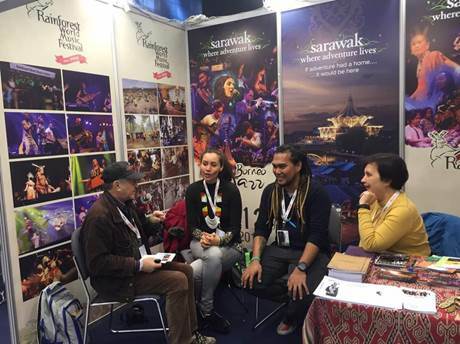 Sarawak Tourism Board representatives attended this year’s World Music Expo (WOMEX) in Poland on October 25 to 29 to promote Sarawak’s trademark event, the Rainforest World Music Festival (RWMF). Also attending this 23rd edition of WOMEX was local musician and artist Alena Murang and musician Eldrick Udos or ‘Bob’. Both Alena and Bob have performed at the RWMF and are also impassioned supporters of maintaining and passing on the Bornean cultural heritage. Alena and Bob were interviewed alongside RWMF Events Director, Angelina Bateman by Drago Vovk of Radio Sraka during the Expo. From the right, Anglina Bateman, Bob, Alena Murang and Drago of Radio Sraka.